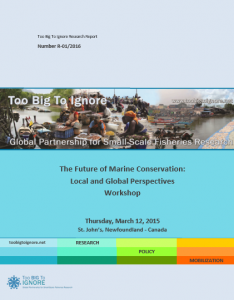 On March 12th, 2015, Memorial University hosted ‘The Future of Marine Conservation: Local and Global Perspective’ workshop. The workshop offered an opportunity to share lessons from various marine conservation and stewardship efforts, including marine protected areas (MPAs), both in the province of Newfoundland and Labrador and globally. It was also a chance to learn about the Global Ocean Refuge System (GLORES), a new strategic initiative of Marine Conservation Institute (MCI), which is a U.S.-based conservation organization that aims to advance ocean protection worldwide. The event was organized and facilitated by Dr. Ratana Chuenpagdee of the Too Big To Ignore project, Department of Geography, Memorial University of Newfoundland, Dr. Rodolphe Devillers of the Marine Geomatics Research Lab, Department of Geography, Memorial University of Newfoundland, Dr. Evan Edinger, Departments of Geography and Biology, Memorial University of Newfoundland, and Dr. Lance Morgan, President of Marine Conservation Institute. The morning session of the workshop was primarily focused on experiences from Newfoundland and Labrador related to the implementation of conservation and stewardship efforts, including MPAs. The session consisted of presentations from local NGOs, academic groups, government agencies, and the fisheries union. The afternoon session of the workshop specifically addressed the GLORES initiative developed by Marine Conservation Institute that was designed to catalyze strong protection for at least 20% of the ecosystems in each marine biogeographic region of the world’s oceans by the year 2030. The participants were introduced to the concepts and perspectives of the GLORES initiative and were then given the opportunity to address natural science and social science elements of the initiative. The participants were also encouraged to discuss and provide insights on the ‘Global Ocean Refuge Criteria’ model. To read the full report from the workshop, see 'The Future of Marine Conservation: Local and Global Perspectives'.